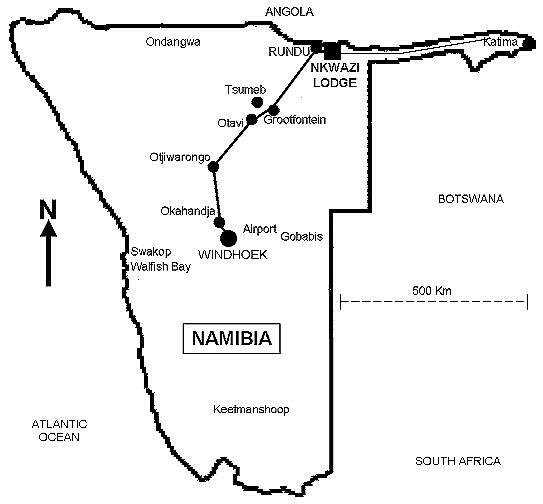 Directions to n'Kwazi lodge in Namibia, East of Rundu. You can get to nKwazi Lodge by air, by bus, self drive or tour group. If you plan arriving by air or public bus, pre-arrangements can be made with us to collect you in Rundu. Ultimately it is better to self drive or to be with a tour group, as that may enable you with transport for day trips and nearby attractions. When driving by road from the capital Windhoek, you need to get and Gas up at Otjiwarongo proceeding to Otavi. At Otavi turn off to Grootfontein, Gas up at Grootfontein and proceed on the B8 to Rundu. Gas up at Rundu and proceed towards Katima Molilo (Divundu) FOR ONLY 11 km. Just about 11Km East from Rundu on the tar road towards Katima, the "Vungu-Vungu/Kayengona" sign points you to Nkwazi, the turn off goes North for about 5Km on a gravel road. At the next intersection, turn Right to East again, towards Kayengona on your way to Nkwazi lodge. Within 4km to an Eastern direction from the gravel road intersection, you should find the n'Kwazi sign board indicating to turn left into a northern direction on a forest road for about 3km until you reach the Lodge. (Do not exceed 90Km/H on a gravel road and 30Km/H on a forest road) It is also not recommended to drive by night. Under normal conditions, the roads had been suitable for most sedan vehicles. If you went inside Rundu and wish to reach Nkwazi lodge on the old gravel road along the river, follow an Eastern direction for about 16km until the n'Kwazi sign board appears on the left. Turn left at the sign on the forest road. If one comes from Katima Molilo or Divundu by tar road, just 11Km before you reach Rundu, turn right and follow the signs.